Amongst many examples, a North American based mining operation worked with Immersive Technologies to develop a continuous improvement training program aimed at increasing tire life using simulation based training. Results were demonstrated over a five month period using tire hours and tire replacements due to damage as the metrics of interest. The training initiative resulted in a 27% reduction in tire replacements due to damage as compared to the same time period in the previous year. Globally, Immersive Technologies continuous improvement projects focused on tire life have resulted in increases in tire life ranging from 3.3% to 14%. “Our Advanced Equipment Simulators are the only fully supported solution of their kind in the mining industry. Scheduled system upgrades are part of our service agreements. The development of these upgrades is driven by evolving mining industry needs, using input provided by customers and equipment manufacturers. 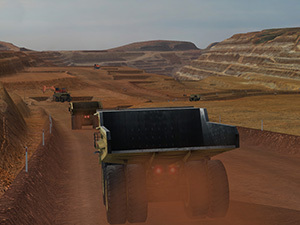 This ensures that our customers are able to continually achieve quantifiable improvement in their mining operations in areas such as tire costs, fuel costs, unscheduled maintenance costs, spotting times, new operator training times and so on.” said Karen Joseph, Product Portfolio Manager at Immersive Technologies. The simulation based training gives equipment operators the skills and knowledge they need to operate in a productive manner while assessing and eliminating behaviors that cause unnecessary tire wear. Properly trained operators extend tire life without impacting productivity. SimControl, the software powering all Immersive Technologies Advanced Equipment Simulators performs detailed monitoring of operator behaviors which directly impact tire wear including operation around spillage, dry steering, aggressive cornering and speeding. “Our simulation based training solutions provide an assessment tool for managers to determine which tire wear related operator behaviors are most prevalent in their mining operation and represent the greatest opportunities for cost reduction,” said Joseph. “As a company we strive to provide solutions to the mining industry and results like these further our mission to make every mining and earthmoving equipment operator safer and their employer more profitable,” said Peter Salfinger, CEO of Immersive Technologies. Through simulation operators are trained to identify and correct errors such as brake misuse to optimize tire life. 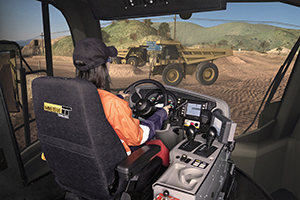 Immersive Technologies’ simulation based training solutions provide an assessment tool for managers to determine which tire wear related operator behaviors are most prevalent in their mining operation and represent the greatest opportunities for cost reduction.